With Endless Mountain Solutions, you dream of what your website can look like and we make it a reality. Don't have a clear dream? We will gladly sit down with you to discuss your business, your goals, and what makes your team great. We can work with your existing logo, or design a new one if you need, and create a design that expresses the things you find inspiring. It may be a classic car, an ocean sunset, or freshly mowed grass. Our goal is to incorporate who you are, what inspires you, and what inspires your clients into your website. Once we have an understanding of your business, we will prepare a rendering of the home page to review with you. We work with you to adjust and mold this rendering into a solution aligning with your brand, and ultimately helping to define it. The color selections, the imagery, and custom details will unite to communicate what you value as a company. If you have an existing website framework, we will take the home page rendering and break it down into the elements you or your existing developer will need to implement the new theme. If you don't have an existing developer or need assistance implementing, we can normally work directly on your web platform to handle the actual implementation. We are here to serve as you need. If you are choosing to use our Website Implementation services, thanks. This provides the easiest and fastest way to have your website design implemented and allows us the greatest control of the results. As you can probably tell, we firmly believe in breaking free of the preset layout or a limited number of colors and fonts you receive with box sites. We believe in implementing the website for your needs; we don't make you compromise your vision to fit the needs of the site. Our framework provides our designer and you the maximum flexibility to get exactly the site you want. Our creative team is ready and we look forward to creating a custom website design for you. When you want to increase team unity and have fun doing it, there is nothing like member t-shirts. ProCare Physical Fitness wanted to encourage their members and provide them the opportunity to have fun while doing so. These t-shirts are also great conversation starters when members wear them outside of the fitness center, promoting the brand and benefits in the community to gain new members. Endless mountain Solutions was able to work with ProCare Physical Fitness to determine what style best fit their needs and to work with the print company to complete the final designs. 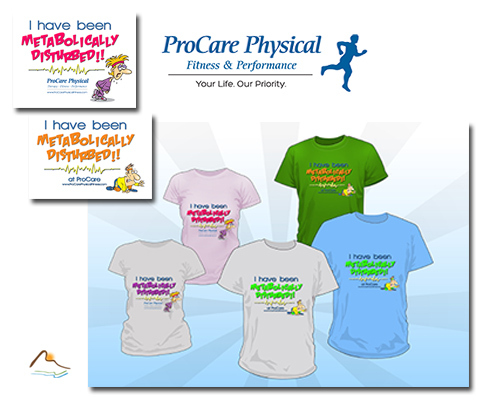 In the end, the t-shirts speak for themselves and we are excited to have worked with ProCare Physical Fitness on this solution. If you know anything about the Warrior Dash, you know you do not look very good at the end of the race. 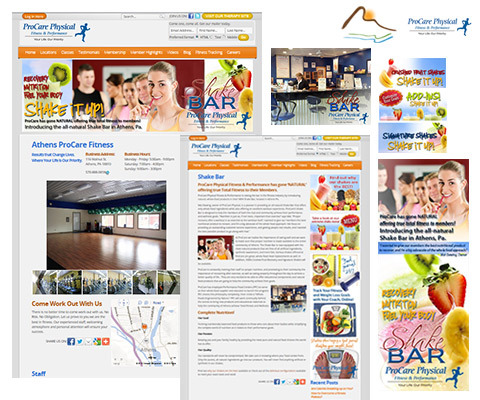 That didn't stop the team from ProCare Physical Fitness from wanting to look good before it. And for that they turned to Endless Mountain Solutions to design their team t-shirt. 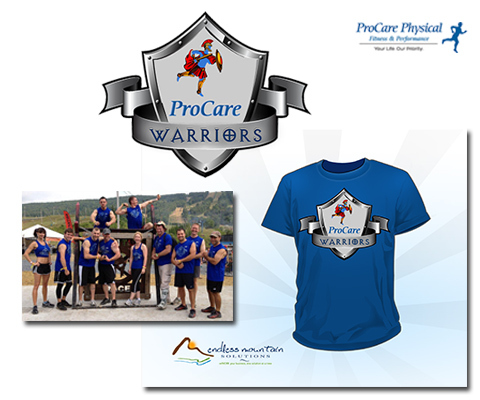 Our graphics department pulled inspiration from the event and created a custom logo for the Procare Physical Fitness team. That logo was integrated into the t-shirt to create a one-of-a-kind look for a team of great athletes. The shirts might not have been the cleanest at the end of the race, but they were the sharpest at the starting line! Sometimes you don't need it all, you just need a company who can get the job done in a quick fashion. 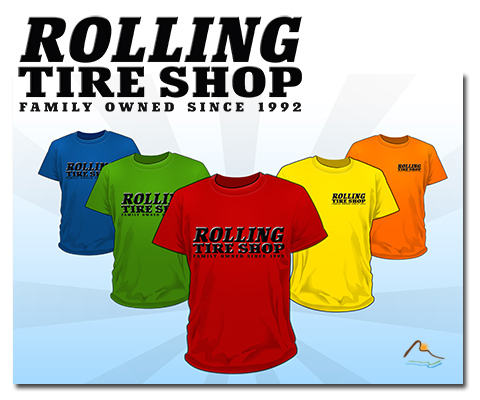 Rolling Tire Shop had a logo for which they had no original. In the past, they had contacted other design companies to have the logo re-drafted and never heard back. Endless Mountain Solutions was very glad to work with Rolling Tire in securing a paper copy of their past logo and re-drafting it for them as a new and improved version. We suggested they add a descriptive tagline and were happy to provide them finished versions with and without it to be used as needed. We were able to quickly turn the request around and provide them the electronic draft they needed for their marketing purposes. Endless Mountain Solutions is proud to work with Rolling Tire Shop, a company that has the excellent customer service we look to emulate.